DrewPz wrote: Just noticed the right outside highlighted in text, so were outside of the indoor event? and your in a Honda on the RX8OC stand so don't complain or you will get banned dear!!! Doesn't that stand for Honda Roasting? Reloy, Rachel, Dave and Roger see you at mine for 7:15 convoy departure, how the neighbours will love me with another early morning zoom! ChrisHolmes wrote: how the neighbours will love me with another early morning zoom! All back together and polished. Too late to grab the last stand slot? Short notice due to a very recent purchase! No problem at all space wise your more than welcome. I am checking out how you get an advance stand ticket just now. Latest info from the organisers, read and digest please. 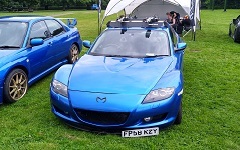 THE EVENT IS HELD AT STONELEIGH PARK, KENILWORTH, COVENTRY. WHEN YOU TURN INTO STONELEIGH PARK, PLEASE KEEP TO THE RIGHT AS THERE IS A LANE SOLELY FOR US TO USE TO MISS THE SPEEDBUMP. THERE WILL BE MARSHALS DIRECTING YOU SO LOOK OUT FOR THEM. PLEASE ARRIVE BEFORE 10AM IF YOU WOULD LIKE A SPOT INSIDE THE MAIN GENERAL JAP SHOW AREA. ALL CLUB STAND AND SHOW N SHINE CARS MUST BE IN AND PARKED UP BEFORE 10AM. YOU CAN ARRIVE AS EARLY AS 7AM. PLEASE DO NOT ARRIVE ANY EARLIER. PLEASE REFRAIN FROM MOVING YOUR CAR WHILE THE SHOW HAS BEGUN. IT IS A STATIC SHOW. PLEASE ARRIVE AND PARK UP. YOU MAY MOVE YOUR CAR IF YOU HAVE BOOKED A DYNO SESSION. PLEASE RETURN TO YOUR PARKING SPOT ONCE YOU HAVE FINISHED. THE TROPHIES AND AWARDS WILL BE DONE AROUND 3PM. VEHICLE MOVEMENT IS PERMITTED AFTER THEN. THERE ARE NO CASH POINTS ON SITE SO PLEASE MAKE SURE YOU ARRIVE WITH CASH. naim22 wrote: Too late to grab the last stand slot? I just looked and tickets seem to still be available, buy a stand one and we will see you there, welcome aboard. Live round the corner so no excuse not to go really! Good man (assuming gender here - apologies if I'm wrong ). I'm taking the scenic route ... just to make sure the engine is nicely up to temperature. I might run it through the Sainsburys car wash (for its 3rd wash of the last 10 months) after my usual Saturday evening enthusiastic drive ... but I'm afraid its as good as it gets for me. Looks like we will have a dry day, bring sun cream? Posted on the iPad so image on a PC will probably be inverted. Think the neighbours had a chuckle as I was finishing her off (the car...) with a wax and half way through there were some spots of rain starting. Put her straight into the garage to finish the drivers side. Best bring some finisher and a cloth tomorrow though and it better not find a muddy road!!!!! Anyone want to buy my stand ticket please get in touch via PM and we will sort something out. Really sorry to hear that. My condolences to you all. BTW,if you guys want to link up with the All.Jap group I'm going with,we'll be at the Shires retail Park Sainsbury's at 8.15 - CV34 6RH.